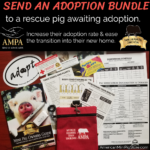 Bringing home a new pig is always an adventure, whether young or old, from a breeder or a rescue. Pigs are individuals with individual personalities. Some are social, some are shy, some are bold, some are fearless, some are timid and meek. Each pig will have a slightly different acclimation period and respond individually. However, all pigs yearn for companionship and want to connect. These are social creatures with a strict herd ranking. To build a relationship with the pig you must earn trust and respect. Gaining a pig’s trust is easy. Be gentle, calm, and bring treats. The first step is to consider the pig’s perspective. If he or she is intact, hormones may play a role in their mood and behavior. Consider their physical condition. If they are fat blind, fat deaf, arthritic, if their mobility is limited due to obesity, if they have injuries, are emaciated then they may feel particularly vulnerable and defensive. Consider the situation they came from. If they were mistreated, abused, neglected, or secluded they may hesitate to make social contact. If they were caught or trapped, moved from one property to another, transported in a loud noisy vehicle, stuffed in a crate against their will, torn from their family or friends then they may be very confused and frightened. Understanding the situation from the pig’s perspective will help you to approach them with compassion and patience. Pigs are naturally prey animals. This means their first instinct is to protect themselves. They will flee or attempt to stay out of reach of anyone they don’t fully trust. Do not take this personal as they are only doing what their nature tells them to do. In the pig’s eyes, trusting another becomes a life or death decision. To put the pig at ease, talk softly and sweet as you would to a timid child. Make your movements purposeful and slow. Do not force yourself into the pig’s comfort zone. If they are backing away, you’ve gotten too close. Take it easy and allow them to approach you. Do not raise your voice. Anything you do to startle the pig is going to heighten his senses and hone in on his fight or flight response. Grab a book or a smart phone and sit in the pen with the most appealing snacks you can find. Get comfortable and just relax. Your ease will comfort the pig during this time of distress. Have a chat with the pig in soothing tones, ramble on about nothing, read out loud to her, sing to her. Communicating without intruding on her personal space. The pig may start off eyeing you suspiciously. That’s OK. Just give her some time. Gently toss some treats in her direction, far enough away from you that she will feel comfortable approaching the food. Slowly toss them closer and closer to yourself. Watch her body language. If she looks nervous or overwhelmed, take it slower. If she is relaxed and eager, than try to lure her closer. Continue talking throughout as it is very soothing to pigs to hear chatter. Any healthy treat is great, but particularly appetizing treats may be: air popped popcorn, cottage cheese, apple sauce, cooked eggs, whole grain cereals, cooked rice, dry oats, nuts, sunflower seeds, or even pelleted pig feed. Continue this as long as needed. It could be 10 minutes or it could take a week. Make sure you are non threatening, but staying low and calm. Don’t rush the process. Just enjoy this getting to know you phase. Once the pig is comfortable enough to eat out of your hands, prepare for step two. Following trust, you must earn the pig’s respect. Pigs live in a world of hierarchy. Each individual in the herd is above or below another. Once the pig realizes you are part of his herd, he will test the waters to see which of you is above the other. This often comes across as aggression. These tests may include head swiping, nipping, biting, charging, or lunging. DO NOT PUNISH THE PIG with anger. He is only doing what naturally comes to him. He is communicating to you that it’s time to establish herd rankings. In this case a sorting board or pig board is recommended. This is a large flat board either homemade or bought for this specific purpose, that you hold between yourself and the pig. This board will protect you from bites and charges. A pig hierarchy battle consists of pushing. A particularly dominant pig will want to move you to show his superior ranking within the herd. If you allow this, you will be faced with further aggression as he will be determined to keep his higher rank by ensuring you are a submissive herd member. Your job now, to gain this pig’s respect, is to push him instead. Avoid a steady push, as that gives the pig leverage and they are strong! Your goal is to steadily bump into the pig to move him back. The shoulder area is the perfect place for this push. As you move the pig he may holler and cause a big commotion. Do not be alarmed. This is his way of complaining that he is not winning the top spot. If he fights back, it is only because he’s giving it a bit more effort to try to win. However, pigs make terrible leaders for us. A pig that feels above a human in ranking will be consistently aggressive and even dangerous. This show of leadership is absolutely essential to developing a good bond with a pig that respects you. Your goal here is to Move The Pig. By bumping into him and driving him back, step by step, you are showing him what a great and strong leader you are. Once the pig turns to walk away from you, you have won. Do not chase the pig and do not continue to bump him once he has retreated. He may approach you again, and if his body language is friendly, you should respond also friendly. However, if he challenges you again, you must move him back. Again, and again, until you have earned his respect. Once he is confident in your leadership, he will not test you like this. Some pigs are easier won than others. Take your time, stay consistent. Do not let the pig scare you into submission or retreat. Do not let him turn the tables on you. Set yourself up as leader, move forward, and you’ll have a friend for life. Or until the treats run out. For all the frustrations you may face, never forget to take pride in the accomplishments you have made with this pig. Each story is unique and every pig is deserving. Watch the body language. Listen and learn about this pig. She will tell you what you need to know, if you just pay attention.